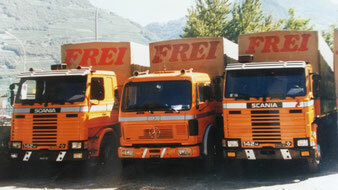 A. Frei Logistics company was founded based on many years experience in the transport branch and has become a reliable transporting enterprise offering high quality services in the area of logistics, complete and partial transport, transport of collective loads as well as of products demanding transport in appropriate temperatures. As a reliable partner we work in a close relationship with our customers. Thanks to professional workers, wide knowledge of the branch and the park of means of transport on the highest technical level as well as modern computer system, we are able to meet even the most demanding logistic requirements of our customers. Flexibility and high self-esteem of the local company are your advantages. The key to the success of a transport company are its satisfied customers. We are committed to constant work on the quality and its improvement. Our definition of quality covers our employees’ skills, flexibility, reliability, working on time as well as the ability to give information concerning the undergoing transport services, following the consignment, optimum time of completing the task, neutral position towards our customers as well as short time of considering claims.